Elizabeth and I have been visiting sites in Israel for the past two weeks. We are delighted to be going home to see Drew, but I wish we had another week or two. I would say that I have been successful in seeing 80 to 90 percent of the places I had hoped to visit. Well, there is always a reason for another visit. We entered the Old City through the Dung Gate this morning and went immediately to the Temple Mount. Everyone who had visited Jerusalem and the Western Wall should remember that the entrance into the Temple Mount is through the Mugrabi Gate. For years this had been a mount of earth. At first if overlooked the Western Wall to the north. Later, after excavations leading to the pre-70 A.D. street, only a narrow mound of earth led up to the Temple Mount. 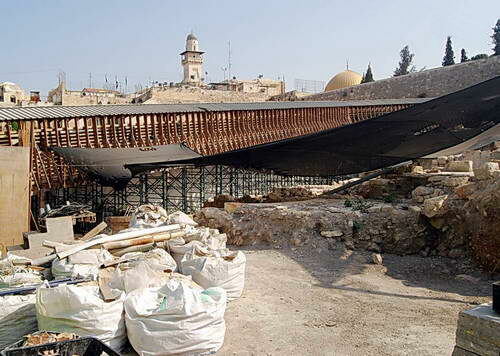 In recent years Israel has erected a new entrance, and at the same time they have conducted excavations in the previous earth mound. There is considerable conflict between Israeli and Muslim authorities over this matter. Here is a view of the Mugrabi Gate today and just a glimpse of the excavations. Mugrabi Gate leading to the Temple Mount. Photo by Ferrell Jenkins. In recent years it has not always been possible to visit the Temple Mount because it is under the control of Muslim authorities. The present Dome of the Rock sits on (or very near) the site of the biblical temple. I was delighted to get some good morning shots of the Dome of the Rock and the Al Aqsa mosque. Here is one of those photos. 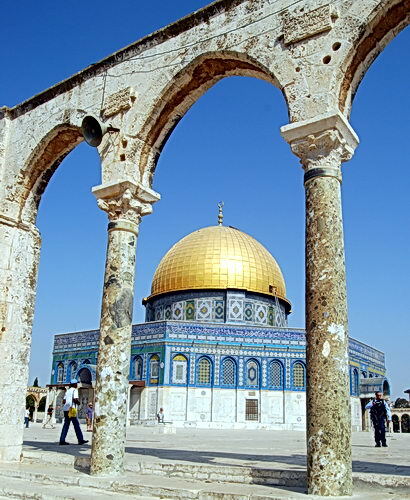 The Dome of the Rock. Photo by Ferrell Jenkins. We made a stop at the Pool of Bethesda because the sun was in the east. This provided perfect lighting for the site. Then we went along the Way of the Cross. At the first stop I was able to make arrangements to visit the museum of the Studium Biblicum Franciscanum. I had been there many years ago and it was good to have a reminder of the collection. SBF has conducted archaeological excavations at Cana, Capernaum, Nazareth, Mount Nebo, and other places. Our next stop was at the Sisters of Zion. This was once the site of the Fortress of Antonio. Many have visited it thinking that it was where Jesus appeared before Pilate. It may have been, but the beautiful Roman street and pavement apparently date to a time after the destruction of the temple in A.D. 70. Nice visit. Very few tourist were at these sites, so we had freedom to enjoy and make photos. Numerous stops were made along the way to the Church of the Holy Sepulchre. We arrived in time for one of the religious ceremonies involving the tomb of Jesus. From there we visited the nearby Russian church to see walls believed to be from the first century. This indicates that the Church of the Holy Sepulchre was built outside the wall of the city at the time of Jesus. I revisited the roof of the Petra Hotel where one has a view of the so-called pool of Hezekiah, and of several important area landscapes. We stopped by the Church of St. James in the Armenian Quarter, and then made some photos of Jaffa (Joppa) Gate. By this time we were ready to head to the hotel. We used a taxi today due to the fact that the entire day was spent in the Old City. We passed along the Kidron Valley and the afternoon sun was on the Mount of Olives. I asked the driver if he would be able to stop at this point so I could make a photo. He agreed. Here is one of the photos. It shows the Church of All Nations. 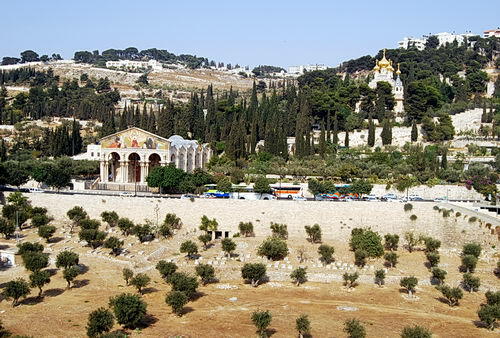 The Garden of Gethsemane is to the left. The “onion top” building to the right is the Russian Orthodox Church of Mary Magdalene. Garden of Gethsemane on the Mount of Olives. Photo by Ferrell Jenkins.